avoid permenant damage. Photo by Rick Fournier. How do I promote bike etiquette? The brainstorming commenced a few days earlier, but an article with a positive spin, encouraging cyclists to exercise good behavior, was elusive. As a cyclist and as a trail-runner, I’ve been on both sides of the bad behavior fence. I know the terror of being pummeled off my mountain bike by a 200 lb., human projectile (earning himself a busted up face and a broken bike, he got the worst of it). Admittedly, I also know how embarrassing it is to be startled from a state of semi-conscious mind-wandering, by an oncoming trail user, whether it be of the two-legged or four-legged sort. Still, the ideas tumbling around in my brain were not of the ilk that inspires good behavior. Before I get to his answer, it should first be disclosed that, in the course of mothering 4 teenage boys, I have dutifully performed my fair share of screechy finger-wagging. More often than not, the result is that I begin to hear, telepathically, what my kids are hearing: wahh-wahh-wahh. I sound like the adults in a Charlie Brown cartoon. Advice on how to avoid having this effect on my fellow mountain bikers was served up with a simple reply, “just tell a story and keep pointing to the positive.” As I pondered this advice, it was soon apparent that the benefits of good trail behavior are plentiful and that they all stem from the same ethic. The very fabric of our society is woven with one simple but absolute ethic. It is the ethic of all ethics. It is the Golden Rule: do unto others as you would have done unto you. When trail users, especially mountain bikers, remain in harmony with the Golden Rule, the consequences are predictable and positive. What is true on the streets, in the schools, work places and in the homes of our communities is many times amplified in the wilderness. Think of the pedestrian who yields a crosswalk to a car. Hmm, great. Now play out this scenario in your head: a hiker yields to a mountain biker. Both have an equal right to the peaceful use of a trail, but technically, the hiker always holds the right-of-way. When a hiker graciously surrenders the right – and they usually do – the message is undeniable, “hey friend, have a great ride!” And, as the wise cyclist carefully passes the hiker with a smile of gratitude, the message, whether it is spoken or just a breathless nod, is equally positive. Happy is as happy does. The effect of good manners out on the trails is significantly more poignant than it is on the city streets. Maybe that is because, when we scrawny human beings venture out of the relative safety of an urbanized environment, we suddenly become part of the food chain – and we’re not at the apex. Perhaps some primal part of our brain causes us to seek camaraderie with others of our species to lessen our vulnerability. Or could it just be that the effect of good manners is amplified in the wilderness because the interactions with strangers tend to be more personal. Really, how many times in a city day do you greet and wish well a total stranger? Yes, I know, there are a few of you out there thinking, “yeah, but what about that jerk who won’t get out of my way?” or “what about that knucklehead screaming down the trail, claiming a ‘Strava right-of-way’ to the horror of all other trail users?” Sadly, we all have at least one of those stories to tell. But, to you I say, “patience Grasshopper.” Be patient and be wise. Remember this happy fact: when making a conscious effort to take the high road, we simultaneously reject the notion that a jerk can ruin our ride and we set an example of true outdoorsmanship. An example that is guaranteed not to completely escape the ominous offender forever. Sooner or later an offender will have an experience that brings him/her in line with the Laws of the Universe and the lesson will be driven home. In the meantime, living with the knowledge that you did the right thing in the face of adversity, by honoring the highest of outdoor ethics, is much more soul-satisfying than the instant, but fleeting, gratification of hurling obscenities – or worse. This is not to say that we, as Outdoor Ambassadors (and we are all Outdoor Ambassadors), should turn the other cheek. Sometimes standing tall for what is fair and safe is required of us, even though it puts us in the line of fire. I recall a time when I was tempted to shove clean off his bike, a surly 20-something year old, donning dual ear-buds and recklessly barreling down a very popular Park City trail. But I didn’t. As fate would have it, even before my higher sensibility awakened, the laws of physics spared me the consequences of committing that ugly deed. When he took his eyes off the trail, calculating how he was going to navigate the single-track, at 25 mph, around me and my then 10 year old twins, he ended up pitching off the side of the trail all on his own. Instead of laughing, or snarling in fury Mama-bear style, I helped him out of the weeds. Once he was standing on his own two feet, though dazed and bloodied, I took what we mothers call a “teaching moment.” It didn’t take much in his weakened state, before this offender was apologizing, swearing an oath never to be so self-centered again. And, in keeping with the code of outdoor ethics, I took him on his word. We looked one another square in the eyes and he gimped away. Selflessness. Yes, it does happen. 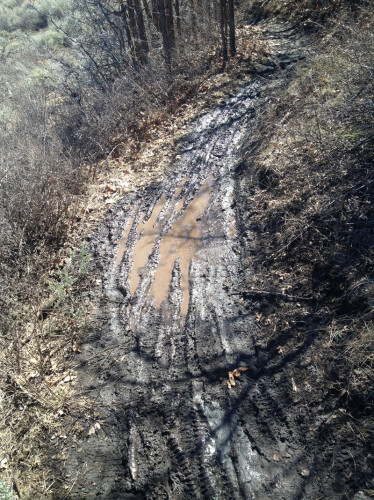 After dutifully checking trail reports, or checking in with the local shop, you show up to a trailhead and it’s just a little muddier than you expected. Or, as has been the case in Round Valley on numerous days this winter, even for the fat bikes, the snow is just a little softer than is appropriate for riding. What do you do? Deep down, you know the answer: #RutsSuck – turn around, get back in your car and implement Plan B (because you do have a Plan B). But, “ahhhh, my workout!” the self-centered-brain screams, “I drove all the way over here!” Like the devil and an angel alighting upon each shoulder, the outdoor-ethic-brain and the self-centered-brain clamor for position. There are two possible scenarios here. The first, and happy, scenario is that you dug deep and heeded your conscience. As the trailhead disappears in the rear-view mirror, there’s a twinge of disappointment, but it is overridden,10-fold, by the undeniably positive feeling of having sacrificed for the greater good. You are savvy enough to understand that your short-sighted goals don’t outweigh the delicate balance between high-quality trails and Mother Nature. In fact, the feeling is so positive and compelling that you are moved to share the story with friends. They, in turn, are equally inspired by your stroke of genius and will follow your lead if/when this ever happens to them. The second scenario isn’t so glossy. Imagine being the one rider everyone hates. You were so convinced that your workout was more important than, say, trail erosion, that you just went for it. Did you really have a good time? Admit it, riding in mud or soft snow isn’t really that much fun. Your entire ride is haunted by the thought that you’ve broken the Code and that you are the bane of the outdoor community. Plus, look at that muddy bike, the rutted trails and the volumes of negative energy that will be spewed your direction when other riders get on those dried up or frozen ruts you’ve created. Clearly, the negative energy created in this scenario far outweighs the benefit. When all is said and done, in society and in the backcountry, we can always count on the fact that when one makes good decisions the outcome is predictably good. And when one makes bad choices, bad consequences prevail. It is a law of the Universe and it is inescapable. “As a Cyclist I. . .
• Commit to making this world a better place to ride. Lora Smith is the Resource Manager for the Mountain Trails Foundation. Find out more at mountaintrails.org. One Response to "Mountain Bikers and the Golden Rule"